Are you on a Spiritual Journey to find God? Alpha Course may be a great option for you. Many spiritual seekers wonder why there is not more historical evidence to verify the birth, crucifixion, and resurrection of Jesus. Here is something to consider. There is no need for more evidence because the Holy Bible itself is historical evidence. he Old Testament has over 60 prophecies about Jesus that were fulfilled. The Bible has the Four Gospels (Matthew, Mark, Luke, and John) that document Jesus' life. The balance of the New Testament has references to Jesus. There are 66 books of the Bible. Almost every single book of the Bible has either a prophecy about Jesus or verses that point to the Gospel message. There are over 24,600 manuscripts of the New Testament and over 24,000 original manuscripts of portions of the New Testament. Why would there need to be more historical evidence? Because some would argue that the Bible can't be trusted, the manuscripts may not be trustworthy, or the Bible is not accurate. We will explore these concepts and prove the Validity of the Bible. Some will argue that you can't trust the Bible because it was written by those who believed in God or Jesus. They will say that the authors were bias, so they did not write accurate information. If you were to use this argument regarding autobiographies, biographies, and history books (this is what the Bible is like), you would like to remove all these books off the library selves. Autobiographies obviously have some bias because they are written by individuals about themselves. They certainly could misinterpret some of their experiences, but how many readers would toss out an autobiography as not a trustworthy book about the author? So, why toss out portions of scripture that are autobiographical? Many biographies are written by people who loved the person they are writing about, but we do not question their validity. Yes, we may see some prejudices or favoritism in a biography, but we can overall trust most biographies, because if they were inaccurate there would be an uproar from others. So, why toss out portions of scripture that are biographical? Unless we have proof they are inaccurate, we need to give them the same trust we would a modern day biography. There are certainly books about history written by those who have had prejudices. We see much more of that in recent years. But again, if someone was to write a very distorted view of something historical, don't we believe others would not be silent? However, regarding the history written in the Bible there was overall silence by those who were alive when the Bible manuscripts first appeared. It has only been in recent years that there has been a challenge to the historical validity of the Bible. What is interesting is that more and more there is archaeological proof to the historical accuracy of the Bible. There is something that is unique about the Bible compared to any autobiography, biography, or history book - the Bible is the inspired, infallible Word of God. This means it was God breathed. The authors of the Bible wrote what God had them to write. Yes, they wrote with their style of writing, but the accuracy of what they wrote was based upon being inspired by God. We know, as a spiritual seeker you may not believe this. That is ok. We are going to provide more evidence for the Validity of the Bible. Some would argue that the Bible can't be trusted because we do not know if the copies we have of the Bible are accurate, or if the original manuscripts are accurate. To determine the accuracy of the manuscripts, we can compare the Bible manuscripts to manuscripts of other literature. If we are going to be fair, we should not require more of the Bible than we do other literature, but the Bible will hold up to even more scrutiny. The chart below lists some documents, how many known original manuscripts, and the time span from the first known manuscript and when the document was authored. After looking at the chart above, which document do you believe is the most trustworthy in being accurate regarding being closest to the original? Homer's Iliad does not even come close to the New Testament. Time span is critical when determining if the manuscript is close to the original. The longer the time span, the more of a chance of error. The first New Testament manuscript has only a 25 year span compared to 500 years for Iliad. Yet many of our readers would read Iliad as the gospel before the Bible. We should also mention that of the 24,000 New Testament manuscripts they are 15 different languages and they all are accurate in their translation. Let's look at one more point regarding the accuracy of manuscripts. It is the concept of textual variations and textual corruption. We will compare Iliad with the New Testament. The Iliad has about 15,600 textual line variations compared to the New Testament which has about 20,000 textual line variations. Not bad considering there are over 23,000 more manuscripts of the New Testament than the Iliad. The Iliad has 764 lines of textual corruption whereas the New Testament only has 40 lines of textual corruption. So, which is the more accurate document? *This data is from "Evidence that Demands a Verdict" by Josh McDowell 1979. There is a newer edition of this book which probably has even more powerful proof of the validity of scripture. As time allows we will update this page, better yet, why not get the book and read it yourself. Even with all the evidence we have provided, some will still say the Bible is not accurate. Archaeology and Science is continuously proving the Bible to be accurate. Over and over again, archaeological digs are finding artifacts that prove the various stories that are in the Bible. Read More. One of the ways to prove the Bible is accurate is to explore the concept of prophecy. There are over 60 prophecies in the Old Testament that speak about Jesus. Every one of the prophecies were fulfilled in the life of Jesus. There are also many prophecies in the Old Testament that have been fulfilled in history. Yes, there are some prophecies that have not been fulfilled. Some were conditional and the conditions were not met so they will never be fulfilled. Others are speaking of events yet in the future. The Bible was written over a 1,500 year span so there is no way that many of these prophecies could have just been 'predicted' by the authors. There were over 40 authors so there is no way they could have conspired with each other. So significant is Jesus in man's history that the Encyclopedia Britannica has 20,000 words in describing Jesus. His description took more space than was given to Aristotle, Cicero, Alexander, Julius Caesar, Buddha, Confucius, Mohammed or Napoleon Bonaparte. Why would there be so much material on a man who was never born? The Encyclopedia Britannica does not state as fact the crucifixion or resurrection of Jesus, but there is no doubt in this document regarding the validity of the Bible regarding there was a Jesus of Nazareth who was the founder of the Christian faith. These independent accounts prove that in ancient times even the opponents of Christianity never doubted the historicity of Jesus, which was disputed for the first time and on inadequate grounds by several authors at the end of the 18th, during the 19th, and at the beginning of the 20th centuries. Jesus is recorded as a fact, as is His death, burial and missing body in the Reader's Digest Book of Facts, 1989. There are several books that cover this subject matter. They have much documented evidence to prove the validity of the Bible. It should be noted that Christianity is a religion based upon relationship, not knowledge. It is a religion of faith not logic. The information provided is to help answer questions, but ultimately you must believe in the gospel accounts of the crucifixion and resurrection of Jesus Christ because you believe in the claims of Jesus that we are sinners and we need a savior. 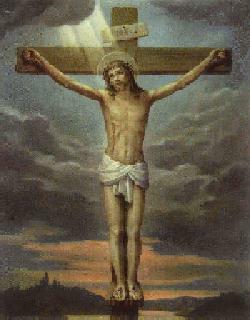 Most of the pictures that you see of Jesus on the cross are not accurate. 1. During His time, most of the crosses were in the shape of a T. The top part of the T, patibulum, is what He would have carried. 2. He would have been naked. 3. His body would have been grotesque to look at.